haha! Is that for real??? It's totally got to be photoshopped. Nah, I'm pretty sure it's for real! Aw man! How embarrassing for them! 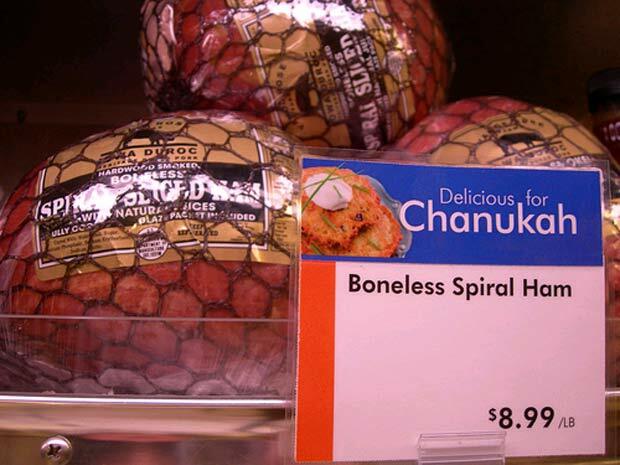 I know, I mean can you believe they misspelled Hanukah?! Sounds like your Passover lunch was prepared by gentiles! Isn't that only if you are a Polish Jew? umm, no? It's Yiddish, which pretty much encompasses all European Jews. Ah, my mistake. I had thought that Yiddish was derived from Polish. Yiddish is actually a weird hybrid of Hebrew and German. Though I don't know Polish, so there may be elements of Polish as well. pretty sure that for ashkenazi jews, the falafel and hummus are right out, as well.